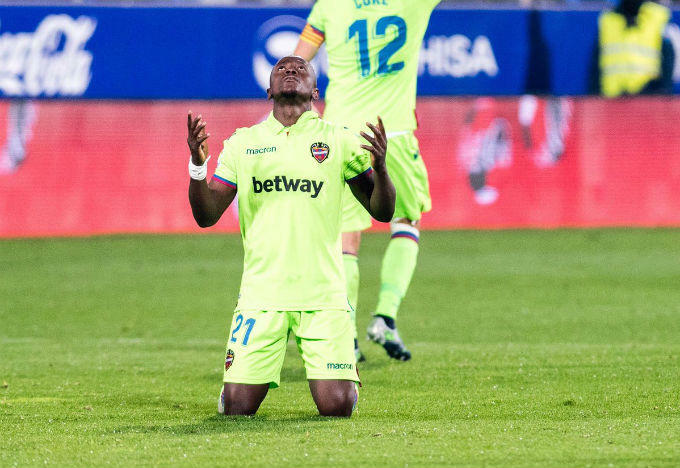 Ghana winger Emmanuel Boateng is on the verge of leaving Spanish top-flight side Levante to China to play for Dalian Yifang, Ghana's leading soccer news outfit Ghanasoccernet.com can exclusively reveal. To date this season Boateng has played in 16 league games with only 695 minutes of playing time. In addition, he has also played 3 Cup doubles scoring a single goal this season. He was the scorer of goal in Alcoraz in a match that Levante managed to equal at the last minute. Boateng started his European career when he joined Portuguese side Rio Ave in 2013, after impressing on a trial, from hometown club Charity Stars FC. Initially assigned to the youth setup, he made his professional debut on 31 July 2014, coming on as a second-half substitute for Yonathan Del Valle in a 1–0 away win against IFK Göteborg for the season's UEFA Europa League. Boateng made his Primeira Liga debut on 17 August 2014, starting in a 2–0 home win against Vitória de Setúbal. His first goal in the category occurred on 1 September, as he scored the last in a 4–0 home routing of Boavista. On 7 July 2015, Boateng and his Rio Ave teammate Ernest Ohemeng made a permanent move to fellow league team Moreirense. Mainly used as a substitute during his first season, he started to feature more regularly during his second. Boateng was also regularly used in the Taça da Liga, netting a brace in a 3–1 home success over Benfica on 26 January 2017. Three days later, he replaced Roberto in the final, a 1–0 win against S.C. Braga; it was Moreirense's first ever national title. Boateng scored his first league double on 30 April 2017, in a 2–2 away draw against Arouca. 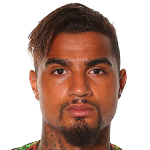 On 16 August 2017, Boateng signed a four-year deal with La Liga side Levante UD and On 13 May 2018, he scored first career hat-trick against champions Barcelona. Levante won the match 5-4, ending the possibility of an unbeaten season for Barcelona. Boateng was part of the Ghana national under-20 football team, that played the 2015 FIFA U-20 World Cup in New Zealand. He scored one goal in the competition on 5 June 2015, in a 1–0 win against Panama. On 30 May 2018 he made his senior appearance for the Black Stars. He marked his debut with a goal when he scored a penalty in the 51st minute of the game.